This entry was posted on August 26, 2012 at 12:16 pm and is filed under Drama with tags 2003. You can follow any responses to this entry through the RSS 2.0 feed. You can leave a response, or trackback from your own site. Well written review, really descriptive. Thanks Vinnie. Much appreciated. It’s worth a look if you haven’t seen it yet. Lovely little film. Good film. Loved the laid back pacing. You can see why Finbar would want to live here, easy going, relaxing. Despite his efforts to the contrary, Finbar still manages to fit in. Loved the scene in the bar where he stands “up” for himself. And Michelle Williams! Ah! I have such a crush on her(have you seen “Marilyn”?). If you’re just getting into “Game of Thrones”, wait till you see the mind blowing season 2! Yeah man. A heartwarming little film. The scene you mention in the bar was great and Dinklage nails that frustration in his character perfectly. I’ve seen season two of Game of Thrones as well. I done the first two seasons back to back. It’s marvellous stuff and again, Dinklage is superb. Not seen Marilyn yet but I have to admit, Williams has yet to grab me. I don’t dislike her but I’m more drawn to Carey Mulligan’s abilities who I think is very similar. I’ll get around to Marilyn but if truth be told it didn’t quite grab me when it was released bug I’ll give it a chance. As for the reviews I’ve posted, I appreciate your checking them out but you should also check out Dan’s (CMrok93) from the other commenters. 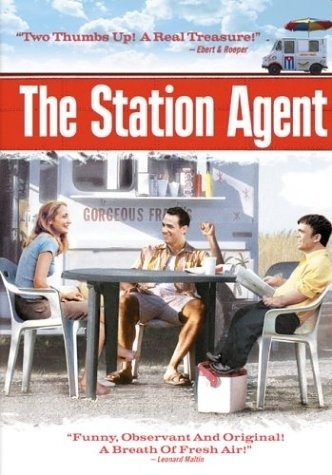 He done a great review of The Station Agent bit so long ago. Good review Mark. This is one of those little indies that his it’s own charms and quirks that always seem to work. Especially when you have a great trio of leads like Dinklage, Clarkson, and Cannavale. All are terribly underrated and deserve bigger and better roles in today’s day. Couldn’t agree more Dan. The three of them are wonderful and play Off each other brilliantly. More work should be given their way for sure. I love these type of film’s and cant wait to see McCarthy’s “Win Win”. It’s a good one, and sort of in the same vein as this one. I’ve got it sitting around. I must find the time for it. Saw this a few months back. I agree, it’s a surprisingly good little film. Dinklage, Clarkson, and Cannavale all play off each other really well. They do indeed Morgan. A lovely, lovely little film with three endearing performances. Great review! I love Dinklage, I too discovered his talent in Game of Thrones, though I saw him in few other things before that, he was really great especially in hilarious Death at the Funeral. I love Clarkson, she should stop doing silly comedies like Friends with Benefits, she is too good for that. Cheers sati! I’ve been a follower of Clarkson’s for a while and I’m amazed she doesnt get better deals. Dinklage I was aware of but hadn’t seen Death at a Funeral (both versions where apparently he plays the same character?) but in Game Of Thrones he’s marvellous. The real heart in the middle of all the turmoil. Great review. I’ll check this one out. McCarthy’s The Visitor and Win Win are also very good. I’ve seen The Visitor and loved it but I’ve yet to watch Win Win. I have it ready to go but time is not kind these days. Can’t wait to see it though. I love McCarthy’s style. Yes, I know how that feels. Hope you find the time soon. It’s very good. I remember discovering this film by accident and being really impressed with Dinklage, and the whole cast for that matter – another low budget indie walk and talk but the acting was superb and the dialogues just felt genuine. I know these people. I’ve stumbled similarly, fallen down practically. Bobby Cannavale too is someone to watch, he makes the most of small parts and leaves a lasting impression. Clarkson is my all time fav. I still can’t stop watching her in High Art. If you’re interested, check out my review of Roadie with Cannavale – he stands his toes. Solid review, nicely to the point. Hey, is this a trend? Can’t beat the good reviews that give you the shots directly. Nice back and forth comments too, some good points about those films – Never Let Me Go is great, and Shame is forthcoming. It’s my trend anyway. I normally write long winded reviews but I’ll edit them down and dump a lot of stuff. I enjoy reading in-depths reviews but would rather mine not like that. I want people to know that when they stop by they will get a quick delivery. Great little film this though. Everything about it was sharp and genuine. I’ll swing by on your link in a bit. Thanks again Rory. Nice review dude. I managed to catch the theatrical release and thoroughly enjoyed it; as you said, it showed a real attention to detail and focus on characterisation. I also think it was one of the first things i saw dinklage in and he was brilliant even back then. On a side note: im sure you’ve heard this before, but if you’re a game of thrones fan i strongly recommend avoiding season 2 and starting on the second book instead. They are far superior to the tv show and comprise a trully outstanding story. Thanks again Henry. I too am an admirer of Dinklage. He’s a great actor. As for Game of Thrones, I’ve already seen season 2 and have to say, it didn’t live up to the first. I’m might move onto book 3 though. Thanks for the advice man. No worries mate. GoT is one of those things that will always suffer from translation issues, unless you have can extend each season to 24 eps with 20 mil budget on each (which will never happen). So much was missed from the book in season 2 that even I, a long time fan, struggled to comprehend what they were doing in some places. And it’s a shame because George RR Martin’s story is so good, that it really should be mandatory reading (like Lord Of the Rings for example); yet I fear many will be turned off after season 2. To be honest, I’d even suggest going back and reading book 2 – so much more happens than in the series and it’s done with a literary competence that is truly remarkable. You’ve certainly sold the books well Henry. I might just go back and do that. Thanks for the info my man.